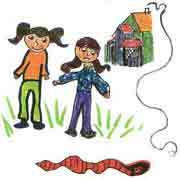 This series of stories for children aged 6-11 is based on the adventures of two earthworms, Sammy and Mr. Sammy, and the two girls, Loring (8) and Clara (6), who love them. The adventures are fantastical and funny. 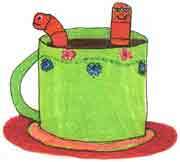 The writing contains wacky wordplay, rhyme, and the confusions of humans learning about a worm's world - and vice-versa. Besides the anthropomorphic worms, we also meet a bumptious bluebird and some very skeptical neighbors. 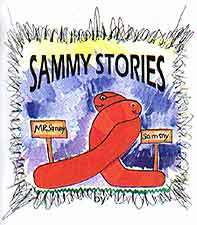 Future stories feature an opera-singing centipede and a ticklish platypus. Click on any of the images to view larger versions.